From 2013 to 2017, the Fourth Working Seminar of the Teaching Steering Committee of the Department of Atmospheric Sciences of the Ministry of Education (referred to as the Teaching and Learning Committee) was held in Zhanjiang, Guangdong Province from July 17-18, 2016. Discipline talent training pays more attention to practical ability. The discipline of atmospheric science is very practical. However, due to the lack of objective conditions, in the course setting of the special course of atmospheric science in colleges and universities, there are ordinary problems in the actual practice of the course, and the practice of the teaching link is relatively weak. In order to effectively solve this problem and improve the practical ability and level, all colleges and universities have taken the “study-school cooperation, internal and external integration” and other methods to create practical opportunities for students and improve their hands-on basis. ability. In terms of “office-school cooperation”, the China Meteorological Administration signed a cooperation agreement with 21 colleges and universities to clarify the key cooperation areas and cooperation mechanisms. At the same time, the provincial meteorological department and its affiliated institutions and 58 universities in science and technology research and development, internship 106 cooperation agreements were signed in the areas of base construction and personnel training. In terms of “inside and outside”, the Education and Development Committee has sponsored the national atmospheric science undergraduate field joint research practice. The first event was jointly organized by Nanjing University and Lanzhou University in July 2015. More than 160 teachers and students from 13 universities participated in the meteorological stations in Suizhong, Wuwei, Minqin, Zhangye and other places. Observe the data, examine the topography and geomorphology along the way, and make weather station weather forecasts. The second field practice was hosted by Zhongshan University in July 2016. The discipline training methods are more diverse. Nanjing University introduced the important dimension of the quality of undergraduate education in the university–learning participation, which led to the participation of the university. Great interest. Learning participation is concerned with practical and objective learning behaviors. After the philosophical orientation of Western undergraduate education research turns to “student-centered”, it is focused on the quality of undergraduate education. At the same time, the Internet continues to play an important role in talent development and curriculum development. How much influence does modern technology have on us? This is a question raised by Xu Xiaofeng, deputy director of the Education and Manpower Committee. He hopes that through the convening of the seminar of the teaching and learning committee, what should be done in the basic education and continuing education of atmospheric science? The sample is suitable for the change to suit the needs for serious discussion. The foundation of the discipline development is further consolidated and fresh blood is continuously added. At the conference, four new atmospheric science disciplines, including China University of Geosciences (Wuhan), Fudan University, Civil Aviation University of China and China Civil Aviation Flight Academy, introduced their academic developments. 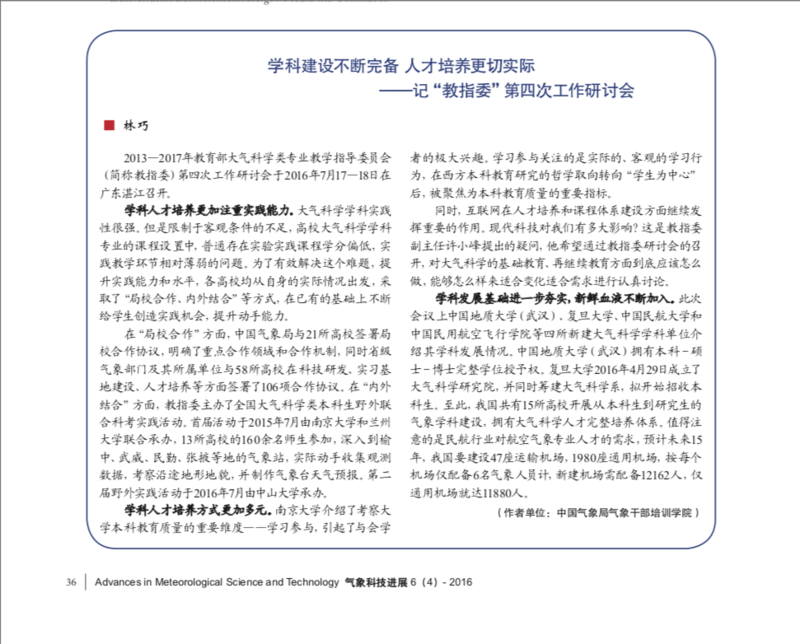 The China University of Geosciences (Wuhan) has the right to grant a full degree to the undergraduate-Master-Ph.D. Fudan University established the Institute of Atmospheric Sciences on April 29, 2016, and at the same time established the Department of Atmospheric Sciences, and plans to start enrolling undergraduates. So far, a total of 15 colleges and universities in China have carried out the construction of meteorological disciplines from undergraduate to postgraduate, and have a complete training system for atmospheric science talents. It is worth noting the demand for aviation meteorological professionals in the civil aviation industry. It is estimated that in the next 15 years, China will build 47 transportation airports and 1980 general airports. According to each airport, only 6 meteorological personnel will be equipped. The new airport needs 12,162 people. Only the general airport has 11,880 people.